Our new raven mew was completed last week by Scout Brenden from Troop 266. He did a heck of a job and got full approval from the ravens. There's ample room and it has plenty of perches. 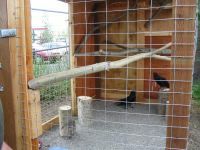 The ravens also have protection from the weather but can get plenty of fresh air. Thanks Brenden!